Molasses Creek Journal: News from Ocracoke Island and Beyond: Happy New Year! We just finished up playing for First Night Williamsburg, one of our favorite concerts for the year. December 31st was a misty, rainy evening for the crowds that came to the campus of William & Mary and historic Williamsburg to hear the 40 or so performers. Molasses Creek shared the stage with Celtic rock band Coyote Run at the Phi Beta Kappa Memorial Hall and giving performances at 5:00, 7:00 and 9:30 PM. Our entourage set off for Williamsburg on the 8:00 AM Ocracoke-Hatteras ferry on a misty, rainy morning unsure if or how long the 40 minute ferries would run (they tend to shut down if visibility is low). Highway 12 also had quite a bit of water on it as we made our way north. Despite the winds, this water came from the heavy rains the night before rather than overwash. Construction vehicles were already hard at work in Rodanthe at the spot where heavy surf always washes away the dunes. We have heard rumor that the beach house featured in Warner Brother’s “Nights in Rodanthe” movie had been sold to a new owner who plans to move the home out of harms way and renovate the interior to match the layout from the interior scenes from the movie (previously a Hollywood set creation). A couple of months ago after a significant noreaster, this beach house was again standing in the middle of ocean surf. The state had apparently condemned the dwelling and given the owners a deadline to move or tear down the house. 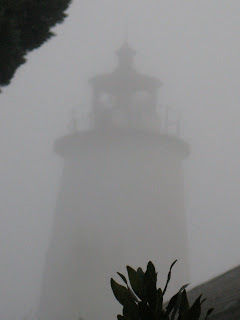 Rumor has it that the company that moved the lighthouse has been contracted to handle the relocation. Gerald Hampton and his wife Beth met us (Fiddler Dave, Gary, Marcy, Lou, and baby Charlotte) at the theater for load-in and sound check early afternoon. Gerald brought his new stand-up bass to the performance. Although he has been only working on it for 4-months, his progress has been phenomenal! He said that the biggest challenge has been switching between the biggest instrument and the smallest one (mandolin). We tried to keep him on his toes during the concert and he successfully made it through three sets without cramping up. We loved seeing so many familiar friends and fans. What a wonderful way to break in the new year! Strolling around historical Williamsburg, sipping hot Cider, smelling the woodburning fires and conversing (even singing) with the colonially costumed residents of the town caused us to give thanks to that endearing human spirit that inspires all of us to share our creative sparks with our communities and the world. We are now traveling back to Ocracoke with full bellies (thanks to a New Year’s breakfast at the Chickhominy Inn, complete with blackeyed peas for good luck), Molasses Creek wishes you the best for this upcoming year. Molasses Creek’s March Madness Northern Tour! While the rest of the world dreads and avoids snowy weather, Molasses Creek is taking advantage of the Ocracoke Island offseason to travel north to see what this white sfuff is all about! Hope that you folks will spread the word about these upcoming dates. Check out the Molasses Creek calendar for details!